Soft, double cream texture. Lactic and creamy when young with walnut and mushroom flavours as it matures. Their small-scale approach to cheese making means that they retain control not only of the production, but also of their power and heating needs. This is not something they undertake as a publicity exercise - it is at the core of everything they do, both at home and in business. The electricity is sourced from ethical suppliers, and as much as possible is generated on-site by a windmill. Heating requirements are amply handled with a customised furnace, burning locally sourced wood. The organic milk used to make Finn is collected in the mornings from Andrew and Rachel Giles' farm at Glasbury-on-Wye. The cows are New Zealand Friesian (very similar to the British Friesian) with some Jerseys. 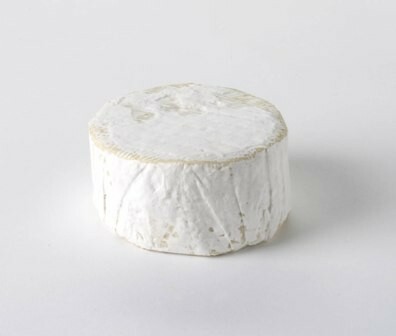 Finn is a soft cheese, but not runny in the way associated with Brie or Camembert. It would be better described as firm but soft with a sweet, slightly nutty and mushroomy flavour and a distinctly salty tang. Like the French double cream cheese, 10% additional cream is added to the milk before cheesemaking starts.